Situated on the riverwalk, this cabin is within 9 mi (15 km) of Ullarselid -The Wool Hut, Agricultural Museum of Iceland, and Deildartunguhver Hot Springs. Deildartunguhver Thermal Spring is 8.9 mi (14.3 km) away. 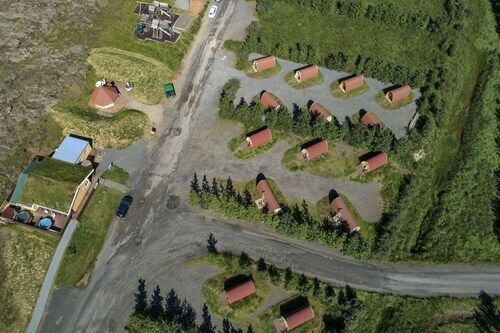 Situated in Borgarnes, this golf hotel is 4 mi (6.4 km) from Hraunfossar and 18.8 mi (30.3 km) from Deildartunguhver Hot Springs. 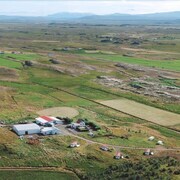 Situated in Borgarnes, this golf hotel is 3.1 mi (5.1 km) from The Settlement Centre and 11.5 mi (18.5 km) from Agricultural Museum of Iceland. Grabrok and Deildartunguhver Hot Springs are also within 25 mi (40 km). Situated in Borgarnes, this hotel is within a 15-minute walk of Skallagrimsgardur, The Settlement Centre, and Husafell Swimming Pool. Borgarnes Transportation Museum and Ullarselid -The Wool Hut are also within 9 mi (15 km). How Much is a Hotel Room in Borgarnes? Hotels in Borgarnes start at $44 per night. Prices and availability subject to change. Additional terms may apply. Travelocity customers will discover 2 options within a 10-mile (16-kilometer) drive of Borgarnes, although you won't find any in Borgarnes itself. The Hotel Glymur, Iceland, which is the closest hotel, is situated 20 miles (32 kilometers) from central Borgarnes. A different Travelocity hotel is the Hotel Bifrost, located in Iceland, 7 miles (12 kilometers) from the middle of Borgarnes. 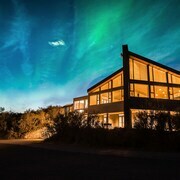 The Fosshotel Reykholt and the Iceland Guesthouse - Hvítá are places to stay that may tick all your boxes. 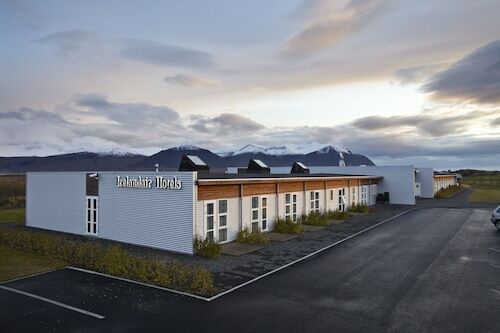 The Fosshotel Reykholt is located 3 miles (5 kilometers) from downtown Borgarnes, while the Iceland Guesthouse - Hvítá is 8 miles (12 kilometers) away. The Hraunsnef Countryhotel is located just 8 miles (13 kilometers) outside the city center of Borgarnes and is a suitable alternative. When you are in West Iceland, you should visit the Kirkjufell Mountain and spend a while in Grundarfjordur, which is located 55 miles (92 kilometers) west of central Borgarnes. The The Old Post Office and Grundarfjördur Hostel are some of those you can choose between. Simply because you and your traveling partners are on a getaway, doesn't have to mean that you can't feed your love for a day of sports. Laugardalsholl can be found 40 miles (64 kilometers) to the south of Borgarnes. For travelers who like the thought of locating a hotel close to the action, book a room in the Reykjavik Central Apartments or OK Hotel. 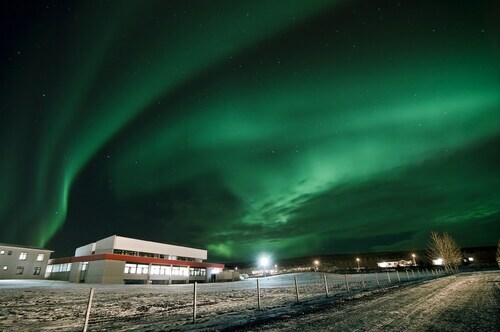 Keflavik International Airport can be found 60 miles (96 kilometers) away from Borgarnes's downtown precinct. 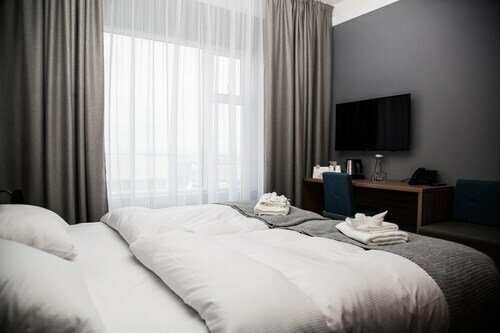 Modern travelers who wish to find a room nearby can look into a room at the Airport Hotel Aurora Star or the Bed and Breakfast Keflavík Airport. The staff were lovely. The food was delicious. It may seem like a small thing, but the bathrobes were super soft and a nice touch after a long day of travel. Amazing Hotel. Helpful in every way possible getting us directions. Accommodating us with helpful suggestions. Great Restraunt and bar service. Breakfast was so nice each morning. Loved our two day stay with Foss. Room beautifulgrest view. The hotel is modern, a green certified facility with a restaurant (and golf, but we were there in January). The staff is helpful and friendly, the lounge area is super comfortable, and there are 2 hot tubs you can use at any time. The view of the mountains is breathtaking especially when gazing at them while sitting in a tub with a cocktail as it lightly snows. 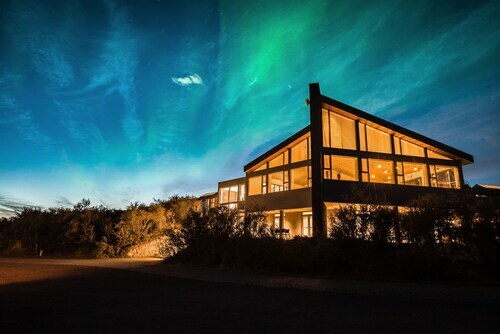 It would be a place to go for star gazing and northern light viewing, weather permitting.